Szass Tam, the current zulkir of Necromancy, is among the most powerful liches ever seen in Thay. But he is not the only Red Wizard to aspire to lichdom. In DR 927, five short years after the Thayans threw off the chains of their Mulhorandi oppressors, a powerful necromancer called Zzarka Tuzarr (LE female human lich Nec13/Red5) took the final steps along the path to undeath. The key to a lich's survival is the security of her phylactery, which is the repository of her life essence. So long as the phylactery remains intact, the lich is assured that her existence will continue forever, even if her physical body is temporarily destroyed. If the phylactery is destroyed, however, the lich herself is also extinguished. Zzarka understood this well even before she became a lich, and she took extraordinary precautions to hide her phylactery away from her many rivals. 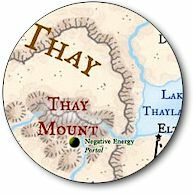 She created a series of strongholds in the most inhospitable parts of Faerûn, along with a secret network of portals to connect them. Zzarka would frequently change the location of her phylactery. She would sometimes entrust this task to her tightly controlled undead minions; sometimes she would undertake it herself. Despite these safeguards, Zzarka Tuzarr has not been heard from in over a hundred years and many presume her, and her phylactery, destroyed. Even if some question whether the lich herself continues to exist, the strongholds she created and the portals that link them still do. Five of these strongholds are detailed below. All of Zzarka's strongholds have been magically sealed against teleportation. The only way to reach them is via mundane means, such as walking, or via Zzarka's portals. Only Zzarka herself knew the locations of all of them, however, and there are almost certainly more. Note to the DM: It's up to you to decide where and when the PCs face Zzarka. Suggestions will be provided within each portal description, though you should choose between ones that may negate other possibilities before you start utilizing these portals. Ramon Arjona is originally from Hawaii. He now lives in Washington State with his wife and two cats. His work has appeared in the Hawai'i Review, the Absinthe Literary Review, and Strange Horizons. He plans to become an 18th-level software developer so he can get the bonus feats.